In a decision that has not gotten nearly enough press, a Michigan Court has ruled that “the state has no constitutional requirement to ensure schoolchildren actually learn fundamental skills such as reading — but rather is obligated only to establish and finance a public education system, regardless of quality.” It is important to note that while some states’ constitutions specifically mention providing a quality education, many, including New York, do not. Here’s a scholarly article that questions some of the central claims of the Common Core ELA Standards. Also on the Common Core, here is a post from Diane Ravitch, digging into the truth about who wrote the CCCLS. Also from Diane Ravitch – An independent, non-partisan, and EXPERT perspective on why the current system of basing teacher evaluations on test scores is complete nonsense. It’s a common refrain to hear how schools should be run like businesses. Usually, though, this is said by people who either don’t understand education or business (or both). Here’s an article highlighting this fact by comparing the current education reform movement to the business approach championed by W. Edwards Demming, who is credited with reviving the Japanese economy as well as having a tremendous impact on American manufacturing. In light of the ridiculous level of testing that our students are already being put through (and the corresponding waste of actual instructional time), many districts in the state have refused to participate in field tests. As a result, the New York State Board of Regents is considering a proposal to “clarify” the regulations and make field tests mandatory. Public comments will be accepted by NYSED between December 3rd and January 20th. We’ll provide more info on that next week, but please make sure you make your voices heard on this issue. Here is the information on Stony Brook University’s Post-Master’s Advanced Graduate Certificate in Educational Leadership Program at MESTRACT / Riverhead School District, tentatively scheduled to begin on 3/24/15. If you are interested in this program, please follow the below steps. The nomination packet for the 2016 New York State Teacher of the Year is available at http://www.p12.nysed.gov/ciai/toty/home.html. 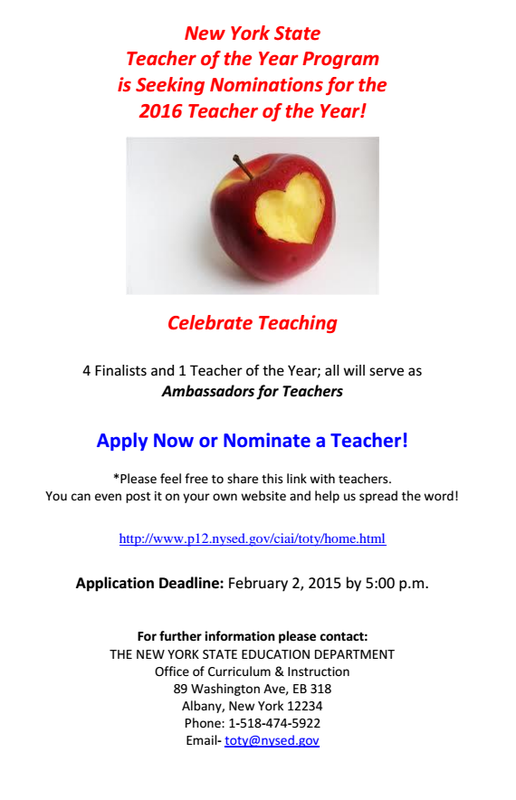 Don’t miss this opportunity to recognize and celebrate exceptional teachers throughout our state. Applications are due February 2, 2015. The story linked below is an important read for any one affected by the education reform agenda (which, basically, is everyone). The overall gist is that, in a report to be released to the public, it seems NYSED greatly understated college enrollment by New York State high school graduates. While this might be easily dismissed as just another in a long string of errors, the implications here are huge. First, we need to remember that the whole reform agenda, including Race to the Top, APPR, the “we have to roll it out all at once, ready or not” implementation of Common Core, etc. is ALL PREDICATED on the supposed fact that our students are not college and career ready. And yet here is evidence that the part of the state’s own data used to support that conclusion is absolute bulls@%$. It’s not just that reformers are applying the wrong fix – they’re “fixing” something that isn’t broken. Second, even if we accept that there is a problem with college readiness (and here’s another article explaining why it isn’t true) a whole other concern is that decisions about educational content and quality, how huge sums of money are being spent, and who will and will not get to keep their jobs in the next few years will all be based on data that CANNOT BE TRUSTED. Obviously none of this is really news to most of us. It’s the policy makers, the politicians, and the voters at large who need to get this message. But it isn’t enough for us just to know things are wrong, we need to be well informed about exactly what is going on and help get that word out. Please continue to spread the truth about the education reform movement by sharing articles like this via email, Facebook, Twitter, etc. Two weeks ago, we told you about plans by the Massachusetts Department of Education to implement a new system where teachers who are rated ineffective two years in a row would lose their teaching licenses. Thanks to a strong response from Massachusetts teachers, the state has rescinded this plan. Proof once again that political action can make things happen and that it is still possible to win some battles. Had this plan held, it is very likely that this type of scheme would have gained widespread appeal among reformers nationwide. We should all be very grateful for our colleagues in Mass. for pushing back so hard. And some very troubling news (via the PJSTA website). This year, the Locust Valley BOE decided to deny the incremental steps provided by in our contract and protected by Triborough. We have filed an Improper Practice charge, our grievance is in arbitration and we, currently, are at impasse in our negotiations. This action, suggested by Terry O’Neill of Bond Schoenck and supported by our superintendent, Anna Hunderfund, if successful, has dire consequences for all public employees. At this point, they are attempting to resolve this through negotiations and are not asking for any outside help. We do not have all the details, but the potential implications here are huge. We will keep you posted. First, there was the inflammatory Time Magazine cover (with it’s very amusing, but probably unintended, irony). Then Gov. Cuomo finally came clean and acknowledged that his goal is to destroy public education as we know it. Or, as he put it, break “one of the only remaining public monopolies.” For more details on this story, and what you can do,click here. We also learned this week what might be coming down the (Mass) pike. The state of Massachusetts is about to adopt new regulations that would strip teachers of their licenses if they receive multiple ineffective ratings. That’s right – not a TIPS plan, not termination, but losing their teaching licenses.